Known for her natural ‘saas’ role in moany movies and TV serials, actress Reema Lagoo breathed her last on Thursday morning due to cardiac arrest in Mumbai’s Kokilaben Hospital. She was aged 59.The funeral will be held later in the day. Soon, all actors who once shared the screen with her reacted with disbelief and the Twitter was abuzz with condomence messages and many actors fondly remembering her controbution to the big and small screen. 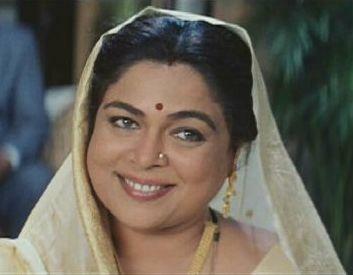 Reema Lagoo became a familiar face in all Hindi households with her role in Salman Khan’s “Hum Aapke Hain Kaun”, “Hum Saath Saath Hain” and “Maine Pyar Kiya”. She had acted with all the big names in Bollywood including Shah Rukh Khan, Akshay Kumar, Sridevi and Madhuri Dixit. She won four Filmfare Awards for Best Supporting Actress. Born as Nayan Khadbade to a Marathi actress in 1958, she changed her name to Reema Lagoo after her marriage to Marathi actor Vivek Lagoo and the couple separated a few years later. Reema Lagoo’s debut in Hindi films was with Kalyug in 1980 and her last film in Bollywood was “I Love NY” in a cameo appearance and her last television show was ‘Naamkaran’. She is survived by her daughter Mrunmayee, a theatre actress and director. Starting from Amitabh Bachchan, Akshay Kumar, Rishi Kapoor, Priyanka Chopra, Paresh Rawal, Nimrat Kaur, Riteish Deshmukh, filmmakers Kunal Kohli and Madhur Bhandarkar expressed their condolences.